Religious Library - Bookcases are located in the rear of the Church, which hold many religious publications (books, booklets and pamphlets) available for use by parishioners. Material is available in English, Portuguese and Spanish. Stations of the Cross - Offered every Friday during the Lenten Season at 6 pm. Extraordinary Ministers of Holy Communion - Extraordinary Ministers of Holy Communion are parishioners who have attended an orientation session and are commissioned by the Diocese to serve in their parish. These ministers distribute the Lord Jesus in the Eucharist at Mass as assistants to the priest when other ordained ministers are not available. In addition to serving at Mass, some Ministers may bring the Eucharist to the sick or shut ins. Lectors - Lectors are members of the parish who read the Word of God at Mass and other prayer services. Altar Servers - Participation is offered to anyone who has made their first Holy Communion. There is a training session followed by an installation ceremony. Members are scheduled to assist at Mass and other liturgical celebrations by the sacristan. Being an altar server is a great blessing. Ushers/Collectors - Parishioners who are responsible for monetary collections at Liturgies and prayer services. Training is provided. Sacristan - The sacristan is responsible for the care of vestments, altar linens, sacred vessels and coordinating the schedules of the Altar Servers, Lectors and Special Ministers of Holy Communion. The sacristan also prepares the altar for various services throughout the year. Altar Beautification Committee - Parishioners responsible for beautifying the church for Holy days and special occasions. They volunteer much time perfecting the arrangement of floral memorials. Cantors - Parishioners who offer their musical talent to lead the congregation in praising God through sacred music. Their weekly commitment to sing sacred music enhances the Liturgy. Youth Choir - Parishioners, aged 9 through high school age, who lead the congregation in praising God through song on Sunday at the 8:30 am Mass and also during special celebrations throughout the year, including First Holy Communion and Confirmation. Their repertoire covers a wide range of songs from traditional hymns to modern and Gospel music. No special musical skills are required except a love of singing. St. Anthony Choir - The St. Anthony Choir holds the distinction of being the longest musical ensemble here at the Parish. The choir consists of adult parishioners that lead the congregation in song on Sundays at the 10:30 am Mass and during special celebrations throughout the year. Their repertoire consists of 4-part Latin Masses, French hymns, Congregational songs and other liturgical hymns. Rehearsals are Thursday evenings 7:00pm to 9:00pm. 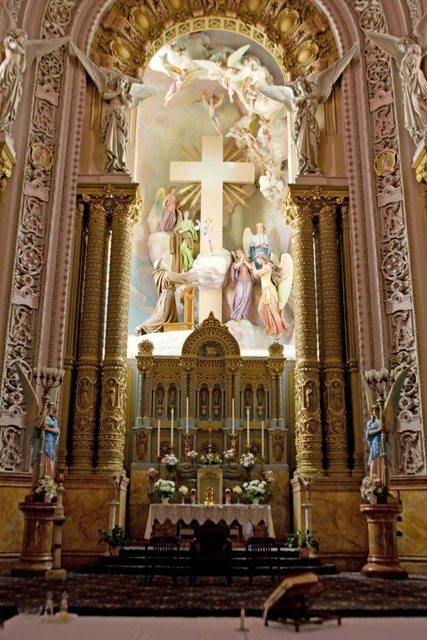 Portuguese Choir - The choir consists of adult parishioners that lead the congregation in song on Sundays at the 12:00 pm Portuguese Mass during the Easter Season and during special celebrations. This ensemble provides the Parish with the beautiful folk-like melodies and the rich heritage of the Portuguese faith. Saint Anthony Senior Citizens - The Seniors group meets every second and fourth Monday of the month from March to December. Pastry and coffee are served at the second monthly meetings and Bingo is played as well. An affordably priced trip or dinner is planned for every month as well as anniversary and Christmas parties. It is a good place to meet old friends and make new ones. Home Visitations - Extraordinary ministers of Holy Communion are available to visit parishioners who are home bound. Father Cortez visits the parish homebound in Advent and in Lent, to hear their confessions, anoint them if need be and bring them the Lord in Holy Communion. Visits are arranged by calling the rectory. Hospital Visitation - Please contact the rectory if a parish member is hospitalized. (Federal Law prohibits the hospital from providing this information to the parish). Visits are provided by a priest, member of the parish community or Diocesan Hospital Pastoral Care. Nursing Home or Extended Care Facility Visits - Visits to health care facilities with parish boundaries can be arranged by calling the rectory. Please notify the rectory if a family member wishes to be visited for prayer and/or receiving Holy Communion. Religious Education - Religious education is available for children in Grades 1 through 8. Additional information about CCD can be found here. Saint Anthony Youth Group - The membership in youth group is open to all young parishioners in Grades 7 through 12 (public and private schools.) This group performs Christian service and participates in many Parish religious activities. Spiritual and fun activities occur on a monthly basis. The youth group blog is a source of additional information. Saint Anthony Youth Group Advisors - A group of dedicated adults who give their time to the Youth group and all their activities. They are expected to attend all social and service meetings of the youth group. Individual advisors are also appointed to act as personal advisors to one of the youth group council members. All advisors are required to attend a Diocesan Abuse Prevention Program and be cleared using the CORI system. Finance Council - A group of parishioners, appointed by the pastor, who work together to balance parish bank statements, complete monthly Diocesan reports and plan for future building maintenance. They prepare and present a report to the Parish Council. Bingo - A major financial support for St. Anthony Church and school is provided through weekly bingo. Bingo is held in the church hall every Wednesday at 6:45 pm. Prior to bingo, players may purchase food from the church kitchen. A weekly menu of homemade food is available. Workers at bingo are unpaid volunteers. Bazaar - This is the largest fundraising event for the parish. Craft groups work all year to make items to sell. In addition to crafts there are games of chance, baked goods, a flea market, penny sale and raffles. A full lunch and dinner menu is available from the kitchen. This event is held the first weekend in November. Festival - This is the second large public social event in the parish's annual calendar. Generally held simultaneous with the Day of Portugal on the first or second weekend of June. In addition to opening our Church to welcome the 10-15 thousand visitors each day, we also make regionally-famous malassadas, have game booths and much more, to raise money for the parish. Ladies Craft Guild - This group of talented women creates a vast variety of crafts. They meet throughout the year to make beautiful handmade items such as aprons, sweaters, scarves, blankets and towels, just to name a few. They also make wonderful decorative and utilitarian items that display their artistic abilities. These items are available for purchase at the annual church bazaar. The proceeds from the craft sales provide a great deal of financial support to the parish. The craft ladies meet every Tuesday from 1:00 pm to 4:00 pm in the church hall. If interested please call the contact person listed. Organ/Church Restoration - A group of people who plan fundraising concerts to help defray the cost of repairing the organ. The Casavant Freres organ has by this point almost been restored to its original grandeur. Holy Ghost Society - This society promotes devotion to the Third Person of the Blessed Trinity, the Holy Spirit. This is done by drawing 7 family names that have the Holy Spirit Crown in their homes during the Easter Season. This group also has dinner/dances throughout the year, including an annual "pig roastin January, to raise funds for the parish. They also provide various activities at different times that promote gratefulness to the Holy Spirit and sponsor donations to the Holy Spirit for favors received. All monies raised go to the Parish. St. Anthony's Ladies Together - This is the main St. Anthony's women's group. In addition to a monthly meeting with spiritual and practical topics. SALT hosts various annual prayer services and meals, provides hospitality at the Masses, leads in the effort to keep the Church clean, knits blankets for the newly baptized and much more. Knights of Columbus - This is the main St. Anthony's men's group. Founded in 2008, they receive formation through the Knights to grow in their identity as men of God, men of the Church and family men, and pool their talents to serve God, the parish and society. They have meetings generally on the second and fourth Tuesdays of the month at 6:30 pm in the parish hall. All parish men 18 and older are eligible for membership. The Knight's web site is a source of additional information. Hospital Visitations - Please contact the rectory if someone is hospitalized and wishes to be visited by a priest. (Federal Law prohibits the hospital from providing this information to the parish). Visits are provided by a priest, member of the parish community or Diocesan Hospital Pastoral Care. Saint Anthony Food Pantry - In the spirit of St. Anthony, we endeavor to care for the spiritual, physical, psychological, social and emotional needs of the poor and needy that come for assistance. We do this by individual and communal prayer with clients, giving out enough food for several days, giving clothes, taking prayer intentions, distributing religious articles, providing periodic nurses for health consultations through the city of New Bedford as well as referral services to other agencies. We also provide opportunities for conversation and the reception of the Sacraments. Delivery of food to the home bound and sick are also provided. Food distribution is on Thursdays from 11:30 PM to 1:30 PM. and any time in an emergency situation. The food pantry blog is a source of additional information. Bullard Street Neighborhood Association - This important civic organization works to keep our neighborhood clean, safe, and constantly improving. The association meetings are held every third Thursday evening of the month in the church hall beginning at 6:30 PM. All members of the community are welcome and encouraged to attend.